Delaware North and the NBA Finals. 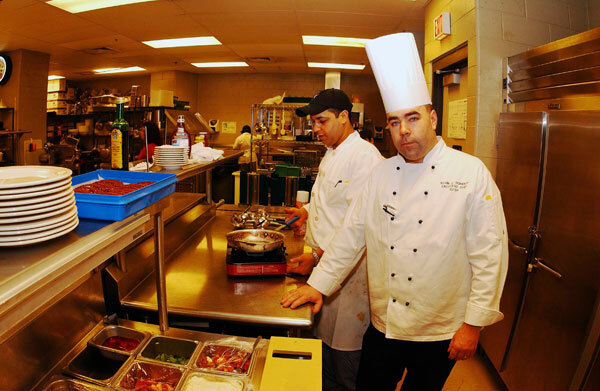 I recently spoke with Delaware North’s Sportservice Regional Executive Chef Kevin Doherty abo ut everything that happened at TD Garden during the NBA Finals. I know most people were worried about what was happening on the courts, but our team had much business in the kitchen. Chef Kevin told me before each of the games, our Sportservice chefs prepared hors d’oeuvres for an NBA VIP party in Banners, one of the restaurants in the arena. Our chefs handled client requests for everything from tofu dogs in a blanket to Boston-themed desserts. According to Chef Kevin, one of the league’s highest ranking officials said “it was the best VIP party food ever.” However, he said he could tell the food was a big hit because of how much the attendees enjoyed it. I will admit I don’t know much about basketball, but I do wish I could have made it to TD Garden during the NBA Finals. Anyway, back to work for me. I have some proposals and a trip to Milwaukee to work on over the next week. This entry was posted on Wednesday, July 7th, 2010 at 2:26 am and is filed under Uncategorized. You can follow any responses to this entry through the RSS 2.0 feed. You can leave a response, or trackback from your own site.